My skin reacts to heat and becomes red and itchy. What are the solutions to regain normal skin? You have hypersensitive skin that has low immunity barrier. Hypersensitive skin is characterized by reddening skin, broken capillaries, smarting sensations, scaling, and even eczema. It can be triggered by UV radiation, chemical contact, medication, hormonal changes, and stress. 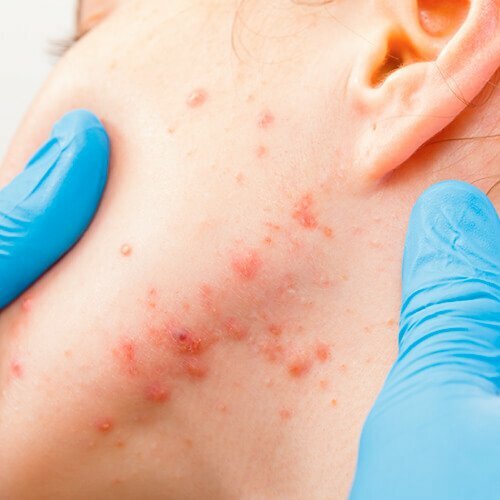 To treat it, you need specialized treatment that reconstructs your skin matrix and strengthens your skin’s resistance against intrinsic or extrinsic aggravators. Hypersensitive skin is delicate and needs to be tended with skincare products that are very mild. Your basic home care skin regimen must comprise of products with low preservatives and are soap-free and alcohol-free, a good moisturizer, and sunscreen with SPF of at least 30. Opt for hypoallergenic makeup and gentle makeup removers too. Avoid sun exposure, hot water, heavy makeup, contact with your skin, and scratching as this will further irritate and sensitize your skin. Its healing process will also be inhibited. New York Skin Solutions uses only all-botanical products to retune your skin gently and effectively, for your fragile skin state.